Two chilled soups within a week! Sounds crazy I know. But hang with me on this. It’s creamy and cold. And no, I am not on an all liquid Vita-mix juice diet. Corn is finally hitting the market. Nothing is more sweet and rewarding than fresh grilled corn. I love eating it directly from the grill right off of the cob. I can barely wait for it to cool down and I always burn the roof of my mouth. A small price to pay for juicy corn! I love corn that is so sweet that it needs no butter, just tons of flaky kosher salt. Mmmmm. The corn crop is pretty light this year due to the drought that the midwest is currently experiencing. Prices are going up and the yield is going down. So grab these babies now while they are hot! Get extra to freeze and pack away like a good little food hoarder. Here is a great resource for preserving extra corn on the cob safely. 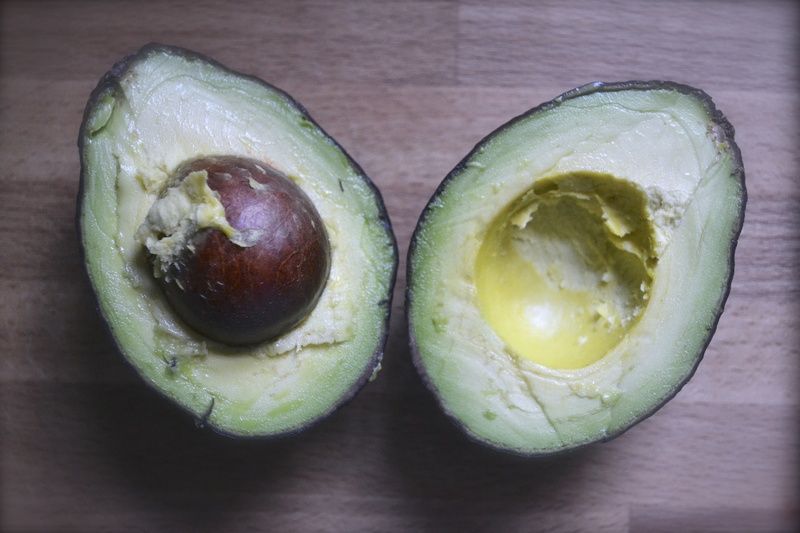 This recipe is inspired by Mark Bittman’s Avocado-Corn salad from the Food Matters Cookbook. The original recipe was chosen by Jenn of Vanilla Lemon. 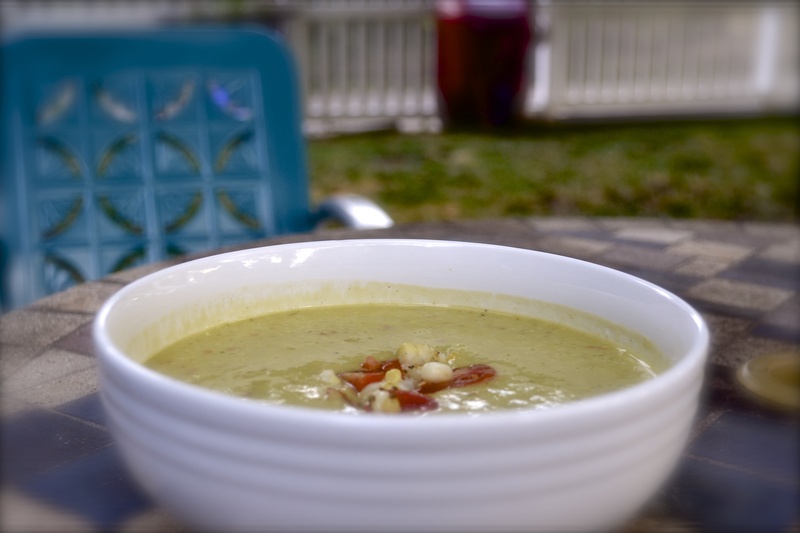 Although the salad itself sounds incredibly delicious, I was also inspired by this Avocado Chipotle Bisque recipe. Seems like the best of both worlds! My chilled avocado and roasted corn chowder gets a great smoky flavor from chipotle powder and from roasted corn. I roasted the corn easily using my gas stovetop oven. Place the shucked corn cob on the burner. Turn the burner on medium-high heat, turning the cob with tongs until it is lightly charred on the kernels to your desired doneness. The kernels can be removed easily by using a serrated knife. Rub the flat backside of the knife up the cob to release all of those great corn juices, allowing the corn juice to drip into either a bowl or the bowl of the food processor. This chowder can easily be made with frozen corn that you wisely stored from the summer harvest. Also, after cutting the kernels from the cob, save the cobs and boil in water to make a corn broth to use in this soup! Handy dandy. 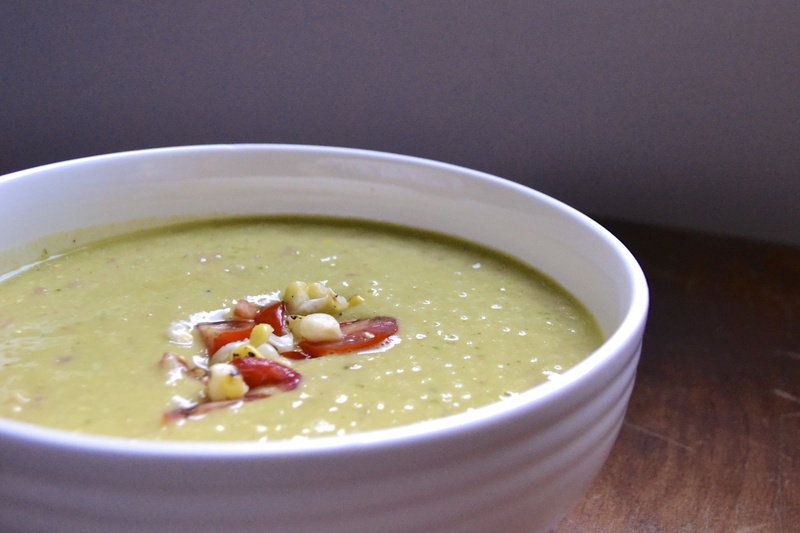 Chilled Avocado and Roasted Corn Chowder (Dairy Free), Adapted from the Food Matters Cookbook and Vegetarian Times. 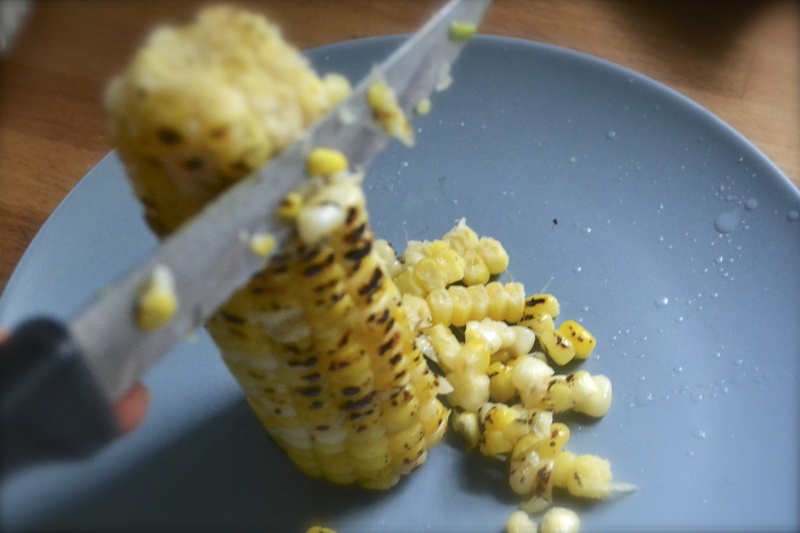 First, take shucked corn and roast over an open flame or grill. 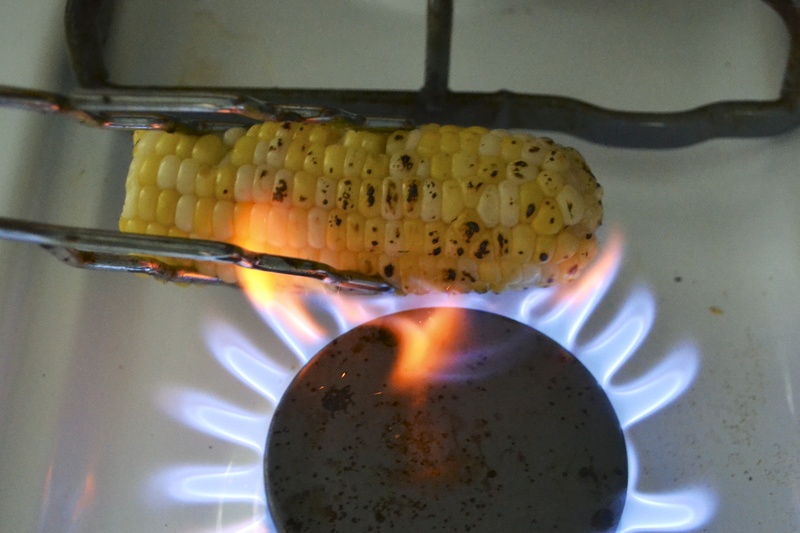 I turn the gas on my stovetop range to medium-high heat and hold the corn over the flame with tongs. Allow the kernels to blacken. This will take about 2 to 3 minutes to roast one cob. Using a serrated knife, cut the kernels from the ears of corn. Using the dull side of the knife, scrape the juices from the cobs into the bowl. The cobs can be reserved and used to make corn cob broth which is detailed here! Place all ingredients in a blender or food processor fitted with the steel blade. Blend until smooth. Serve immediately or chill for up to 1 day. Serve topped with diced cherry tomatoes, roasted corn, and cilantro. I roasted my corn too for the salad. I just love it. That’s awesome. Tastes like candy! This soup looks fantastic, Alissa! I wish I would have gone the chilled route…thanks for the inspiration! Grandmothers have that ability to make everything better. I had never had avocado soup until this trial. I will definitely be experimenting with others. This looks delicious! Can’t wait to make it! Definitely a refreshing, yet filling soup! Wow, that soup sounds great! wowsers! i never thought of roasting anything over the stove top! smart!